I have no progress photos because I was kinda in a hurry. But to get technical, the plushie's mostly made of polarfleece, with the tummy and paws made of wool. Mostly the stitching is machine made, but the white stitching is all handmade. I had a fun time with the patterning, as the last time I ever made patterns was almost five years ago. But I'm learning, and sewing is fun. As of now, it cannot be mounted to a person's back, but that will be a later upgrade. 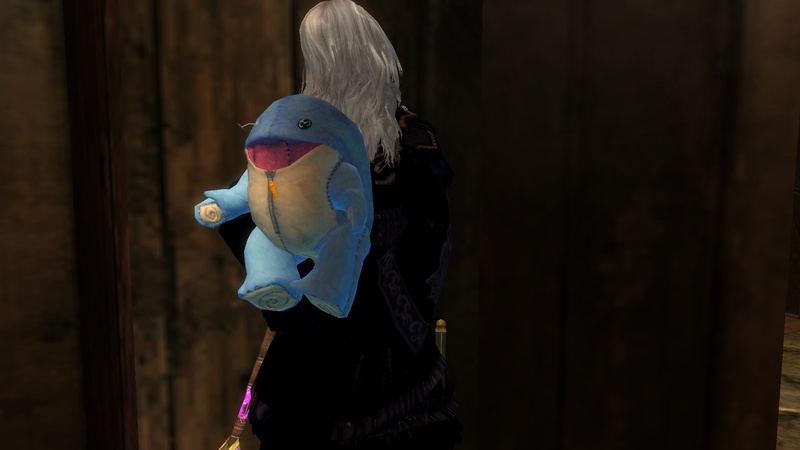 No quaggans were harmed in the making of this plushie. The stitching, while rough, is robust. Made to look like it's been well-worn and loved. The spots on the back are just pieces of darker blue polarfleece sewn on. ...And sitting on his mommy's lap. She liked him very much. So yes, I don't make only swords and guns. Sometimes I make soft, cute amphibians. ; w ; It's so damn cute.